By the way, Crafty found a neat and faster win – 74. … Rc8! 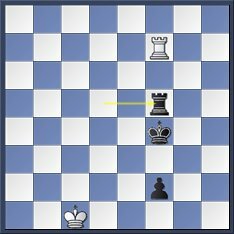 Only rook moves – Rd2, Rd5, Rd6, Rd7, Rd8 lead to a draw. 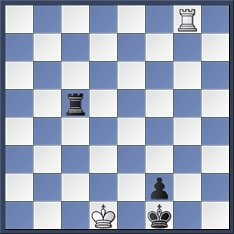 It is actually a second method of defense in Philidor position when white rook can’t get to the third line. It was found by M. Karshtedt, that you still can draw by checking from behind. 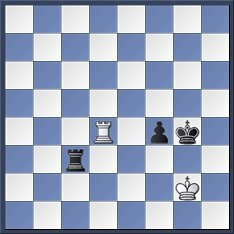 White king should stay on the short side, to allow, if necessary, checks from the long side. In my game White lost after 70. Kf2 Rc2+ 71. Ke1 Kg3 72. Rd3+ f3 73. Rd8 f2+. 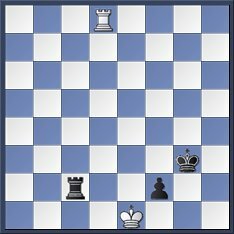 very interesting, but can’t you play f1Q+ after 14.Kd1 and win with queen against rook? Anonymous – I saw it, but I realized that it could be a longer story. The last thing you should want to try and do is blitz out a queen vs. rook endgame. I can’t even remember it, would be difficult enough in a standard game. Nice theory, BTW. 🙂 I like how the pawn keeps the defending king one more file away. Like Aziridine says, always nice to play on the board what you have studied/learned. Congrats. linuxguy – just in case I refreshed my Q vs. R memories :), I studied it and forgot that Philidor position. 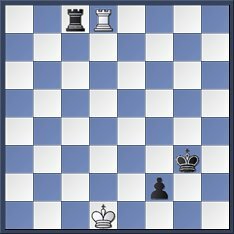 I was fascinated with Nalimov analysis of that last position in the post, how innocuously looking moves lose right away. Aziridine – yeah, I got Lucena second time in 8,000 blitz games 🙂 and once OTB. But seriously – as more you learn as more your chances are to get it in a game. It’s just I learn openings much more then endgames and it’s a pitty. Ok, that’s a good argument, especially in blitz. In any case, your method is more interesting and a good example to learn from. Chesstiger & Anonymous – thanks. I find these rook endings very interesting and will try to learn them more. You never know when it will come in handy. It’s nice to have enough time in between tournaments to study endgames, if so motivated. Once the tournaments come up, I find it’s usually a little more about patching up an opening and some tactics study. linuxguy – you are right. I got another rook endgame 🙂 (correspondence), so have to study it too. Maybe will post when it will finish, it will depend on result – if I’ll escape with a draw :). Sometimes I regret not going back and studying those particular games (versus tactical games). linuxguy – I am sure you know, that on ficsgames.com you can find all your games, why don’t you try? You know, for me having some ending in the real game makes it much more interesting to learn, than just going and studying different kinds of endgames one by one. Rollingpawns, yes, I do have my games saved too, it’s just that I need to get them organized, been putting it off; this should be my next big chess project. Also, I brushed up on Queen vs. Rook today.